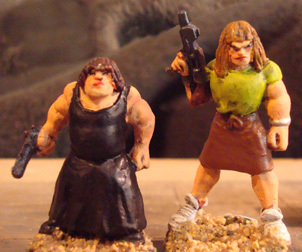 Since I started writing about Plasticville, I haven't won an ebay auction. So I've had to do without Plasticville, but I still want to make buildings. The only idea that came to mind was to make buildings myself. The Little Dutch Boy is the unofficial headquarters and hangout for one of the gangs in my campaign, the 'Coneys' (AKA The Gun Bunnies). 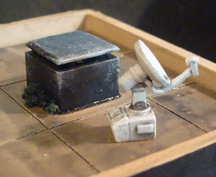 It's pretty much building-making at it's simplest: A box glued onto a base. 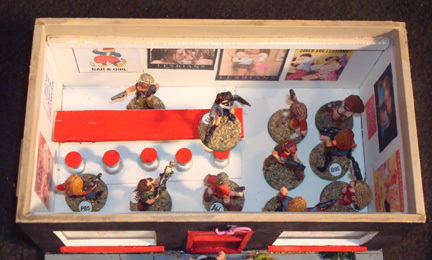 It's smaller than the average Plasticville building, a far more pleasing size, to my eye. Both box and base are cut from 1/8 in Sintra, glued together with cyano adhesive. The base is scribed to show sidewalk details, with a few cracks added for good measure. The trash can is made from dowel, with putty and paper for the trash bag & trash. The Coneys' gang sign can be seen on the sidewalk beside the can. The walls are mostly blank, except for the doors & windows cut into the front. A vent cut from another building has been attached to one side. 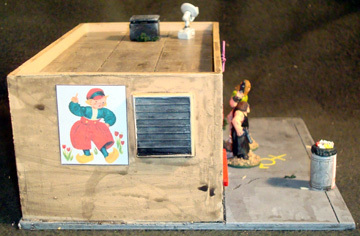 The roof has tile detail scribed into it, and an air conditioner (made from a LEGO piece) and an eM-4 satellite dish attached. The air conditioner acts as a handle, making roof removal so much easier. I tried a new formula for weathering, and it was less successful than I would have hoped. The door and windows are styrene, glued to the inside of the walls: Sills and framing are lengths of matchstick. The bar and seating inside is a removable unit, made from scrap sintra. The seats are push pins. Supports for the roof are glued to the front & rear walls. The posters decorating the walls are 'motivational' posters downloaded from the internet. The front windows are decorated with signs glued to the inside. The neon sign over the door is made from wire. Wow. Those windows are NOT square. 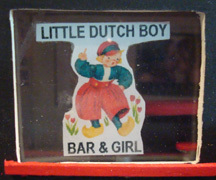 Sharon & Joy are the proud owners of The Little Dutch Boy. They are more than able to deal with any problems that come up.